It is time to align our efforts on climate change mitigation and adaptation planning, to increase the returns on investment in climate change and infrastructure and attract more funding for implementation. 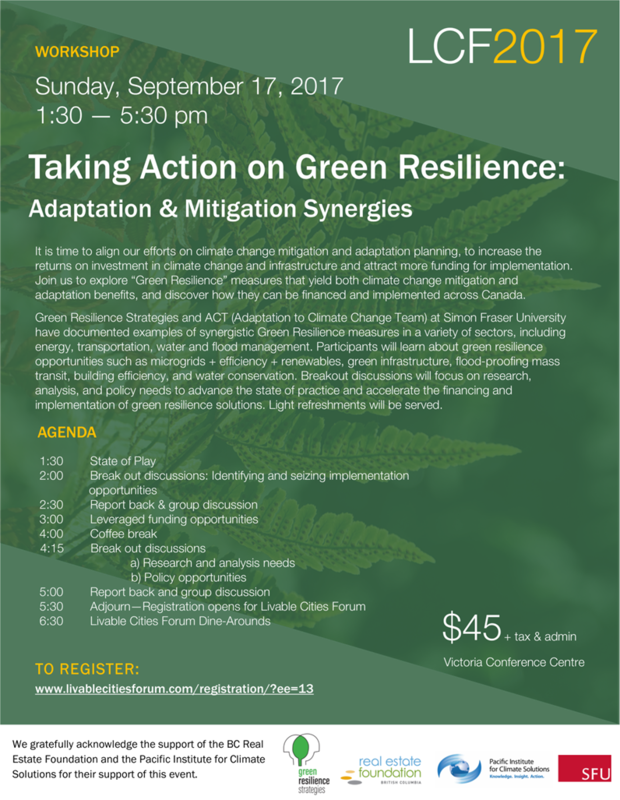 Join us to explore “Green Resilience” measures that yield both climate change mitigation and adaptation benefits, and discover how they can be financed and implemented across Canada. Green Resilience Strategies and ACT (Adaptation to Climate Change Team) at Simon Fraser University have documented examples of synergistic Green Resilience measures in a variety of sectors, including energy, transportation, water and flood management. Participants will learn about green resilience opportunities such as microgrids + efficiency + renewables, green infrastructure, flood-proofing mass transit, building efficiency, and water conservation. Breakout discussions will focus on research, analysis, and policy needs to advance the state of practice and accelerate the financing and implementation of green resilience solutions. Light refreshments will be served.